Who said you need specialty security locks for retail unit-theft? Here a Lock-down for Fast Pitch Baseball Bats is created with standard Padlocks without any loss of professional look. A colorized Padlock body kept the standard solution from looking “Plain Jane.” Rather than fancy locks, the Faceout was designed for a standard solution. 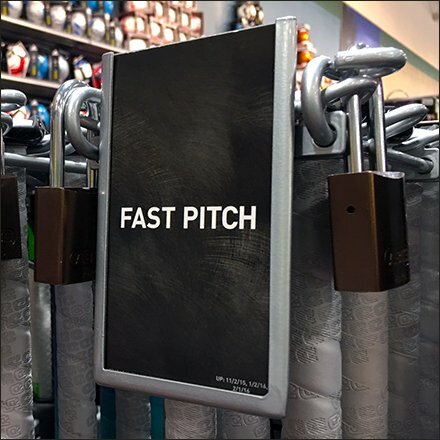 See this Lock-down for Fast Pitch Baseball Bats in the gallery of images, and that each side of the dual lane presentation locked separately. I suspect there is a common key to all locks however.